Miller PhotographyUFTers like (from left) Bronx educators Dorothy Evans of PS 75 and Erica Brown of PS 157, and Queens members Pat Groves of PS/IS 113, John Harrington of IS 93 and Martin McKeown of PS 143 join the rally to support low-wage workers across the state. 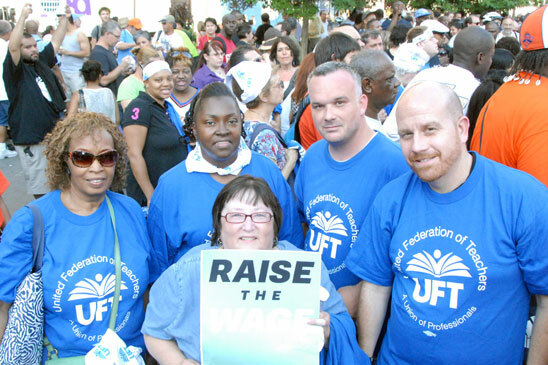 UFT members joined more than 1,000 other union members, as well as political, community and religious leaders at a rally at Union Square on July 24 calling for an increase of the minimum wage as part of a statewide Day of Action. One by one, restaurant, laundry and supermarket workers, health aides, retail workers, taxi drivers and domestic-care workers told stories of their unfair economic treatment to ralliers. And even for those who spoke no Spanish, words like “respeto” and “dignidad” were clearly understood. Among those who spoke was Adan Nicholas Flores, who works at a Queens car wash for $5.50 an hour. Like many of the 600,000 exploited workers in the state, Flores works 60 to 70 hours a week with no overtime and is required to sign a paper stating that he earns $20 a day in tips to make it appear that the employer is meeting the state’s $7.25 minimum-wage law. Modesto Vidal Sanchez, a worker in the produce department of an Associated supermarket, told of being fired three days ago for trying to organize his fellow workers. The minimum wage was upped in 2009 to the present $7.25 — the federal standard — from $7.15. Ralliers began at a press conference in Greeley Square, at 34th and Broadway, before marching to join 1,000 others in Union Square. They then carried their message to Con Edison headquarters in solidarity with the 8,500 locked-out workers and to a Manhattan car wash at the end of the day. Clergy from all faiths cast the story of the struggle for decent wages and working conditions as a moral as well as an economic one.